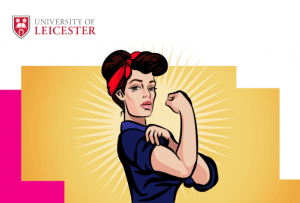 The University of Leicester was the first university in the UK to introduce a menopause policy. Members of the Business School wrote the Government Equalities Office report ‘The effects of menopause transition on women’s economic participation in the UK’. Its authors explain how their findings drove them to introduce a menopause in the workplace policy within the organisation and the impact it’s had so far. Why did you introduce a menopause policy? We published the Government Equalities Office report on 20 July 2017. In undertaking the research for the report, we became very aware of the reasons why employers need to take this issue seriously. This means thinking about possible effects of menopause symptoms on women’s experience at work and the possible effects of the workplace on those symptoms. 1. The UK workforce is ageing and women over 50 are by far the fastest-growing group of employees. 2. There have already been two successful tribunal cases brought on the basis of menopause – one against British Telecom in 2012 and one against Scottish Courts and Tribunals Service in 2018. 3. When people leave jobs, this costs employers thousands of pounds in recruitment and selection. They lose experienced members of staff and must invest time to train their replacements. 4. There is a very strong social responsibility case that women should be able to work for as long as they like, without being hampered by menopause symptoms. So, as the academic team who did the government research, we wanted to put best practice into place by making the University of Leicester the first university in the UK to have a menopause policy. This also very much reflected the University’s status as a 10 X 10 X 10 HeForShe Impact Champion – one of 10 universities selected to take part in a UN global solidarity movement for equality – and its commitment to gender diversity and inclusivity across the institution. How did you introduce best practice? Removing any taboo around menopause so everyone could talk about it openly without embarrassment. Women feeling able to discuss their menopause symptoms and ask for support if they need it. We want them to continue to be successful in their roles and enjoy the right life-work balance. University leaders and line managers feeling confident to have supportive conversations and to be clear on the University’s policy and practices, supported by HR, Health and Wellbeing, and the Occupational Health teams. Work started on the policy in July 2017, with a cross-functional team made up of the three of us, Health and Wellbeing Lead – Nicola Junkin, Occupational Health Manager – Cathy Howells, Head of Equality, Diversity and Inclusion – Leyla Okhai and Henpicked’s Deborah Garlick. We were also joined by Sue Fish of StarFish Consulting, a Leicester MBA alumna and the former Chief Constable of Notts Police. We decided early on that we needed to compile a formal policy because this would signal that menopause at work was a priority. Alongside this, we worked on guidance for line managers and a menopause factsheet as well as a video to outline the importance of our initiative. The launch event in October 2017 attracted over 100 colleagues, and the policy went live the following month. Since then we have run Menopause Roadshows for staff who couldn’t attend the launch event to hear about our work. We have also held monthly Menopause Cafés. In just eight months there has been a noticeable change at the University of Leicester. The Menopause Café banner stands every day in the main staff dining area as a bright visible marker of the change around menopause at the University. It is no longer taboo but visible and in the everyday. We began by aligning our menopause policy with the ongoing commitment for HeForShe already in existence at the University. In the last few months the menopause policy has been linked to a new policy on maximising attendance. Plus, the University of Leicester Coaching Academy have designed a specialist coaching stream for menopause which is about to launch. Next, we are about to see menopause and the menopause policy as part of a new online training for new managers. This makes it available to existing managers too. Our objective was that menopause was no longer taboo but seen as part of working life. Menopause sits alongside other legal, health and safety, and human resource training requirements for new managers which signals that we are on the road to succeeding. What we have achieved in a few months has been fantastic. We are confident the policy will be an unquestioned part of management and operating at the strategic heart of the University. We haven’t undertaken a formal evaluation yet, but we will soon. What we do know is that the vibe around menopause is resonating. 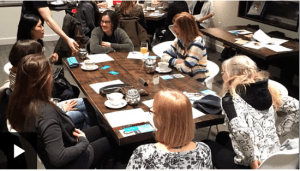 Our monthly Menopause Cafes are informal gatherings which we began as part of International Women’s Day celebrations. These have continued each month, held in a public space, and so not hidden away. We share conversations over tea and coffee and it has been great to hear each others’s experience of menopause. At first there were just nine participants and at the last event there were 26 attendees. Our Glenfield site have asked to hold a Menopause Café too, after we ran a really engaging Menopause Roadshow there. Our main conversations remain concentrated on the sheer variety of menopausal symptoms. There is a sense of relief to name it and know about it. People share tips on how they are managing menopause symptoms at work and at home. This includes things like having a notebook on the desk at work. This is a place to write lists so as not to forget things due to menopause intermittent brain fog. There is no shame but an acknowledgement and a caring and fun way to work with the brain fog. The initiative of women managing menopause symptoms has been remarkable. It has been wonderful to create a space to talk about this. Other conversations are about how the policy has allowed people to start conversations with managers. These stories have really helped people who had some worries about starting the first conversation with their team. What we have also been hearing is that confidence to talk about menopause is growing. Much of the action is happening without using the formal processes or occupational health. We find adjustments and solutions through informed, human conversations between colleagues and line managers. Our Occupational Health team have really championed menopause, and this month Cathy Howells was invited to speak at the Faculty of Occupational Health and Medicine in London about our menopause policy and initiatives. There are lessons we have learnt and need to tackle next. This includes how to open up the conversations to staff whose working hours are not office hours. Some staff find it’s not easy to get online, so our video, information and the policy are perhaps less accessible. We need to think how we keep our visibility and information in material forms and formats, and in convenient locations. We also aim to offer sessions in different languages to celebrate the multicultural and international context we work in. Professor Jo Brewis, Dr Andrea Davies and Dr Vanessa Beck, together with Dr Jesse Matheson, published the Government Equalities Report ‘The effects of menopause transition on women’s economic participation in the UK’. They’ve now put their research into practice, creating the UK’s first menopause-friendly university, supported by Henpicked: Menopause in the Workplace‘s team.